The Work Less Institute of Technology: Because Working Less IS a Technology! The Problem with "The Problem of Social Cost"
Here's one snapshot of how the U.S. economy evolved in the last 15 years: an identical number of total hours worked in 1998 and 2013, even though the population rose by over 40 million people, but a 42% gain in output. If the quantity of work were fixed, as the lump-of-labor fallacy holds, one way to reduce unemployment would be to limit the hours individuals can work, or to encourage early retirement. But fighting unemployment with these policies have [sic] not succeeded. France passed laws in the last decade requiring a 35-hour workweek. 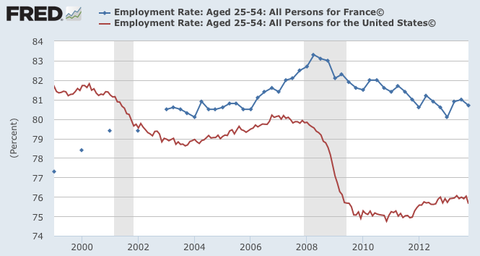 Much of the impetus was that the unemployment rate in France had exceeded 11 percent for most of the 1990s. But international comparisons yield no evidence of a statistical link between lower average hours worked and the unemployment rate. Back in 1998, workers in France already averaged a relatively low 1,600 hours of work a year, compared with roughly 1,850 hours per worker in the United States and Japan – countries with much lower rates of unemployment. France and other European countries have also encouraged early retirement, partly on the grounds that it “creates jobs” for other workers. (Among the promises of early retirement for some and more jobs for others, the question of who will pay for early retirees to enjoy the living standard they’ve come to expect was rarely discussed.) Today roughly 37 percent of French and Germans 55-64 years of age hold jobs, compared to 58 percent of the same age group in the United States and 52 percent in Britain. Despite the success of France and Germany in encouraging early retirement, they face chronic unemployment far in excess of the rates in America and Britain. Attempts to honor the lump-of-labor fallacy by spreading out a supposedly fixed quantity of work over more workers have thus proven unsuccessful. "Since the late 1990s we have completely traded places: prime-age French adults are now much more likely than their US counterparts to have jobs. "Strange how amid the incessant bad-mouthing of French performance this fact never gets mentioned." Abstract: The lump-of-labor fallacy has been called one of the “best known fallacies in economics.” It is widely cited in disparagement of policies for reducing the standard hours of work, yet the authenticity of the fallacy claim is questionable, and explanations of it are inconsistent and contradictory. This article discusses recent occurrences of the fallacy claim and investigates anomalies in the claim and its history. S.J. Chapman's coherent and formerly highly regarded theory of the hours of labor is reviewed, and it is shown how that theory could lend credence to the job-creating potentiality of shorter working time policies. It concludes that substituting a dubious fallacy claim for an authentic economic theory may have obstructed fruitful dialogue about working time and the appropriate policies for regulating it. It is widely recognized that the assumption that wages are rigid is central to Keynes' explanation of the persistence of unemployment. J.E.S. 1984. "[T]he Classical Theory has been accustomed to rest the supposedly self-adjusting character of the economic system on an assumed fluidity of money-wages; and, when there is rigidity, to lay on this rigidity the blame of maladjustment…. In its crudest form, this is tantamount to assuming that the reduction in money-wages will leave demand unaffected.… It is from this type of analysis that I fundamentally differ… J.M.K. 1936. Two-thousands words into a blog post about the prehistory of "efficiency wage theory" I stumble across the first sentence above. Can anyone please explain to me what the point is of doing "rigorous scholarship" when that kind of slipshod hearsay misrepresentation fronts an entire industry of poverty-pimping, "theoretical modeling" of unemployment? Imagine a world in which there are two kinds of people – employers and workers. The workers are identical and there is a fixed number of them. They enjoy buying things but they don't like to put any effort into their work. Each worker is either employed or unemployed. …the town is the American profession of academic economics, the classic automaton theatre is neoclassical economic theory, and the Neues Zaubertheatre is the introduction of the cyborg sciences into economics. Except, Mirowski was wrong. The workers in this mathematical model world are not "clumsy, amateurish automatons" with "jerky, abrupt motions." They are not automatons at all. They have no motions of their own. Instead it is the model builders, the robotic academic economists, who enact the clumsy, jerky motions of amateurish automatons as they display their phantom models. A hollow paper figure represented a clown, or a fireman, or a bearded professor. When you put a captured bird inside, the poor creature's desperate attempts at escape produced in the paper figure a series of wild comic motions. The hollow paper figures are the micro-founded models that academic economists concoct. The captured bird inside is the data, whose frantic attempts to escape its makeshift cage produce a travesty of action in the figure of the representative agent. Economic science: "this magazine of untruth"
Stinting and saving... without stint or shirk! 'Tis work, work, work, without stint or shirk. And his name it is John Bull. "Oh, then," cried the lad, "where's the good, I should like to know, of going through years of hard work, and stinting and saving, in order to get rich, if it's possible to make one's fortune in an instant, as you say." The "Ngram" chart above shows the frequency of occurrence, in books published between 1890 and 2008, of the terms "efficiency engineer" and "efficiency wage." The blue hump represents the reception of Frederick Taylor's Scientific Management. The red hump marks the ascendency of New Keynesian microfoundations. William Kent: Mr. Tobin has told us of the case related by Mr. Taylor where the work formerly done by 600 shovelers and other laborers with average wages of $1.15 per day was, after scientific management had been applied to it, accomplished by 140 men whose average earnings were $1.88 per day. Mr. Tobin says that what interests him the most is what became of the 460 men who were displaced. Mr. Taylor accounted for some of them by saying they got jobs for which they were better adapted than for shoveling, at higher wages, in the same works, but he had not kept track of the rest of them. It is creditable to Mr. Tobin's sympathetic heart that he thinks of the 460 men who were thrown out of a job, but if he thinks they long remained without jobs and that they were sufferers in the long run, he is infected by the fallacy commonly held by the unthinking that the amount of work to be done in the world is a definite and limited amount, and that if either by the use of machinery or by improvement in the method one man is enabled to do the work formerly done by two men, then one of the men is thrown out of work and he and his family are permanently injured. This fallacy is referred to by Mr. Taylor in his book on Scientific Management, page 13, in the following words. "The great majority of workmen still believe that if they were to work at their best speed they would be doing a great injustice to the whole trade by throwing a lot of men out of work; and yet the history of the development of each trade shows that each improvement, whether it be the invention of a new machine or the introduction of a better method, which results in increasing the productive capacity of the men in the trade and cheapening the costs, instead of throwing men out of work, makes in the end work for more men." The persistence of this fallacy of the workmen for the past 150 years, ever since the power-driven spinning and weaving machinery began to displace the old spinning wheel and hand loom, and the hand workmen destroyed the machinery and set fire to the mills, is based upon one of the best traits of human nature, sympathy for one's fellow man. Sympathy is one of the noblest emotions, but it is apt to exaggerate visible evils and be pessimistic. It says, "There is a poor workman thrown out of a job, the bread is taken out of his mouth, and he and his family are left to starve." It has no use for unemotional history, statistics, logic, and common sense, which all tend to the more optimistic view, that whenever a machine or a method of operation causes a piece of work to be done by fewer men, throwing some men out of employment, the money saved by reducing the cost of the work constitutes a fund which does not remain idle in the bank, but is used to give other employment to the same or to other men. It is an axiom among men that have given thought to the subject that the work to be done in the world is not limited except by the facilities for doing it, and by the money available for paying for it. If the Bethlehem Steel Company saved $75,000 a year by throwing a large number of shovelers out of a job, it had that much more money to spend in other departments. Just as much ore was shoveled as before, and the $75,000 went into paying labor to add to the world's store of machinery or other desirable products. A second dimension of efficiency wages involved shirking and stints. Some workers (some of the time) have an inner drive to work hard; most workers (most of the time) are willing to coast a little. Furthermore, shop-floor culture in the United States (as opposed to, say, Japan) encouraged peer group pressure against anyone who tried to work too hard. Close supervision to monitor output was expensive and was, in any case, keenly resented by good workers. It was better to select workers who were less inclined to shirk by offering high wages and to use a trial work period to screen out any shirkers who slipped through. Spot checks to identify and fire shirkers made loafing expensive for the workers; the higher the wage, the greater the possible loss. Closely related to shirking was the problem of the stint. A group of workers would develop a standard rate of performance -- a stint -- and would harass shop mates who surpassed it. When management tried to increase the stint, workers denounced it as a "speedup" and threatened to strike. But the stint, and the perception of speedup, were relative and psychological. By careful selection, it was possible to find those workers with higher stint levels and to create groups that naturally produced more -- working faster and with less waste -- than groups held back by workers with lower stint levels. Every employer wanted high-stint workers, and so had to pay more to hire and retain them. Efficiency wages and careful hiring policies allowed firms to select workers who demonstrated higher stint rates -- who worked harder. Firms which gained a reputation for high wages and hard work, soon attracted and kept workers who felt comfortable with such a regime. Workers without the characteristics desired by management were not hired (except by mistake -- and then quickly fired). The rising real wages are explained by efficiency wage models only if productivity increased; otherwise, management would be making a huge mistake in paying more wages but getting no more output. Frederick Taylor called this alleged standard rate of performance "systematic soldiering," which he attributed, as Mr. Kent cited above, to the fallacious belief "that if they were to work at their best speed they would be doing a great injustice to the whole trade by throwing a lot of men out of work." Professor Jensen and Mr. Kent can't both be right. But they can both be wrong. Furthermore, the source of their error is endemic to the cult of economics. It arises from a facile, ambivalent usage of ambiguous terminology to mean one thing or its opposite depending on who is acting and who benefits. A true commons is a stinted thing; what Hardin described [in "The Tragedy of the Commons"] is not a commons at all but what is nowadays called an unmanaged common-pool resource. As with the constraints on the commons, markets were stinted for social and moral ends. No one was left to follow his or her own ends without regard for the group. Stepping back from the temptation to romanticize the commons, it may be observed that the regulations Hyde cites -- however social and moral their ends may be -- favored "insiders" over "outsiders." The double standard exercised by economists doesn't represent anything new. It merely replaces one set of insiders and outsiders with another, thereby transforming "hucksters and higlers" into entrepreneurs and investors. In The Anti-Capitalist Mentality, Ludwig von Mises carried the apotheosis of hucksterism and higgling to an outlandish extreme, crediting what he termed "the three progressive classes" of savers, inventors and entrepreneurs with sole responsibility for driving social evolution from savage cave dwellers to modern industry. In von Mises's account, as in the Polish joke, it is not the capitalists who exploit the workers but the other way around. It is "the common man", "the rest of mankind" who enjoy most of the fruits of the savers', technologists' and entrepreneurs' endeavors even though "they did not contribute anything" to the achievement of economic progress. Excerpt: Martin Jay's "Dialectic of Counter-Enlightenment: The Frankfurt School as Scapegoat of the Lunatic Fringe"
An Inquiry into those Principles, respecting the Nature of Demand and the Necessity of Consumption, &c.
Sandwichman makes pop-up books, teaches Labour Studies at SFU, used to work in a co-op grocery store and writes on working time, labour history and the history of economic thought. He has recently completed the manuscript, Jobs, Liberty and the Bottom Line.